Squeeze is a safety inspired dual action auto retractable knife, with an enhanced rubberised grip for maximum comfort. 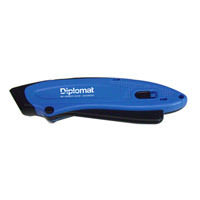 Lightweight plastic construction makes this tool the perfect companion for any individual. Comes with 1 blade, suits all standard duty utility blades.